Pinterest appears to be a soothing way to kill several hours of otherwise productive time until you look at how you’ve used the data you collected as images. Dare I suggest it has real value? I find Pinterest to be a right-brain filing system. In general, I collect images that appeal to me. I find the action profoundly soothing after crunching numbers or brainstorming a business element. Sometimes I use the system as designed, and go to the article from which the image was pulled, but often I just want to look at pretty pictures. I recently cut myself off from Pinterest wanderings, because I thought I was stealing productive time from myself. I couldn’t justify it when I had so many other things to do. Pinterest wasn’t a waste of time after all. So I pulled away, and finished my list of the physical things I needed to get done … only to realize that the time I’d spent on Pinterest helped me hone my plan. By simply grabbing every image that appealed to me, I let my right-brain have ready input on the projects that I was piling up. 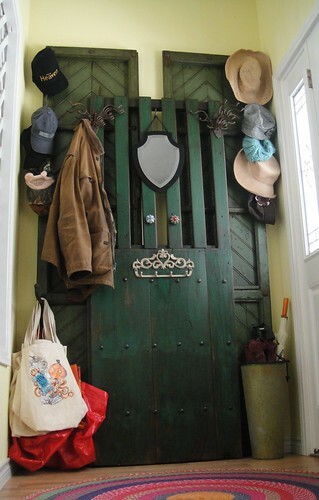 Consequently, when I was ready to get a hall tree, I knew the elements I wanted to incorporate, and I knew of my love of doors and doorways. I’ve got a bit of construction and building design experience. I designed and built small buildings (to code) at Renaissance Festivals for several years. So I’m not at all surprised that I like to look at small buildings. Will I use this information? Maybe … I still consult on building design, and I might build a guest room or two on my property. If my collection is any guide, the guest rooms will not be nearly as whimsical as the buildings I designed for faires. So I’m back to letting myself have some Pinterest time. Maybe my right-brain can tell my left-brain what the next project will be.